Global Poverty: What Are Our Obligations? 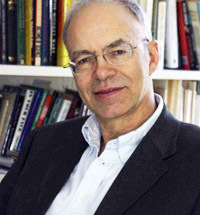 Peter Singer, dubbed "the world's most influential living philosopher" by The New Yorker and named one of Time's 100 Most Influential People in 2005, became internationally recognized as the father of the animal rights movement after the publication of Animal Liberation (newest edition by Harper Perennial) in 1975. A sought-after keynote speaker, he has spoken at major universities and conferences across the country. Since its original publication, Animal Liberation has awakened millions of concerned individuals to the shocking abuse of animals everywhere, and has inspired a worldwide movement to eliminate the mistreatment that occurs in "factory farming", the fur industry, and product-testing procedures. In this classic and in his "Ethics and Animals" talk, Singer offers sound arguments questioning the assumption that the human race should have the right to use all other species as they so choose. He proposes reasonable, humane solutions to what has become a profound environmental, social, and moral issue. Singer has authored several other groundbreaking books including: Democracy and Disobedience; Practical Ethics; Marx; Hegel; Animal Factories (with Jim Mason); The Reproduction Revolution (with Deane Wells); Should the Baby Live? (with Helga Kuhse); Rethinking Life and Death; Ethics into Action; The Way We Eat (with Jim Mason); and, most recently, The Life You Can Save. He also co-authored The Greens with Bob Brown, founder of the Australian Greens. Singer has edited or co-edited Test Tube Babies, In Defense of Animals, Applied Ethics, and J. M. Coetzee and Ethics, among others. Singer's works have appeared in more than 30 languages. He penned the major article on Ethics in the current edition of the Encylopaedia Britannica. Two collections of his writings have been published: Writings on an Ethical Life and Unsanctifying Human Life, edited by Helga Kuhse. Two collections of critical essays about his work include his responses: Singer and His Critics, edited by Dale Jamieson, and Peter Singer Under Fire, edited by Jeffrey Schaler. Born in Melbourne, Australia, in 1946, Singer was educated at the University of Melbourne and at the University of Oxford. He has taught at the University of Oxford, La Trobe University, and Monash University, and has held several other visiting appointments. Since 1999 he has been the Ira W. DeCamp Professor of Bioethics in the University Center for Human Values at Princeton University. From 2005 on, he has also held the part-time position of Laureate Professor at the University of Melbourne, in the Centre for Applied Philosophy and Public Ethics. Singer was the founding president of the International Association of Bioethics, and with Helga Kuhse, founding co-editor of the journal Bioethics. Outside academic life, Singer is the co-founder and president of The Great Ape Project, an international effort to obtain basic rights for chimpanzees, gorillas, and orangutans. Singer is married with three daughters. Apart from reading and writing, he enjoys hiking and surfing. "Singer's documentation is unrhetorical and unemotional, his arguments tight and formidable, for he bases his case on neither personal nor religious nor highly abstract philosophical principles, but on moral positions most of us already accept." "Probably the single most influential document in the history of recent movements concerned with animal welfare." "A most important book that will change the way many of us look at animals -- and, ultimately, at ourselves." "A persuasive and inspiring work that will change the way you think about philanthropy ... Peter Singer challenges every one of us to do more, to be smarter about the ways we go about giving, ands hows us that, working together, we can make a profound difference in the lives od the world's poorest."